I'm not a patient person at all. Just ask Ward. But when it comes to finding the right shoe for me, patience is priceless. A couple of months back I received an invite to join the Mezamashii Project. I really enjoyed my Wave Rider 15s I wore throughout the winter, so I was excited to try out some new Mizuno's. First I tried out the Wave Rider 15s, but Women's wide. Too narrow and my bunion hated it. Second, I tried the Men's Ronin. Ouch. Far too narrow and again, a very angry bunion. I'm so sorry, Ronins. I wanted it to work out. Third, Men's Musha. Third times a charm, right? You betcha because these shoes are incredible! Let me tell you, this shoe is so light and flexible, it feels incredible on my foot. I did enjoy the structure of the Wave Rider 15s, but I also really enjoy a lightweight shoe. I've been running in them for a couple of weeks now, with probably close to 80 miles on them and I am very happy with them. I see these shoes taking me through the rest of marathon training and the marathon. See, patience pays off for sure. 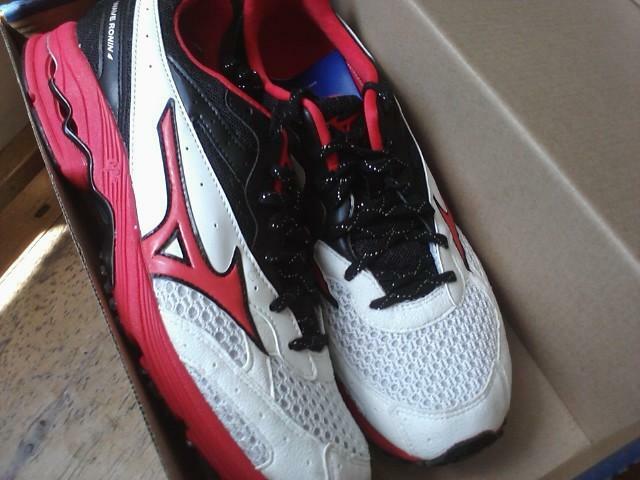 I am impressed with the level of customer support I received each time I called into Mizuno regarding my shoe woes. They were very kind and supportive each time. I know they were faced with a difficult, picky person here who has very odd feet. Actually, one of the representatives did suggest that I visit my local specialty shoe store to try on some Mizuno's so I would have a better idea of what would fit on me or not. So I headed off to Maine Running Company to visit my pal, Seth, and he showed me what they had and answered all of the questions that I had. Here is some Mezamashii Love for you. All of the Rail Trail Chicks are sporting Mizuno's these days. Love the colors of those shoes!! Glad you finally found a shoe with the right fit... so very important!! 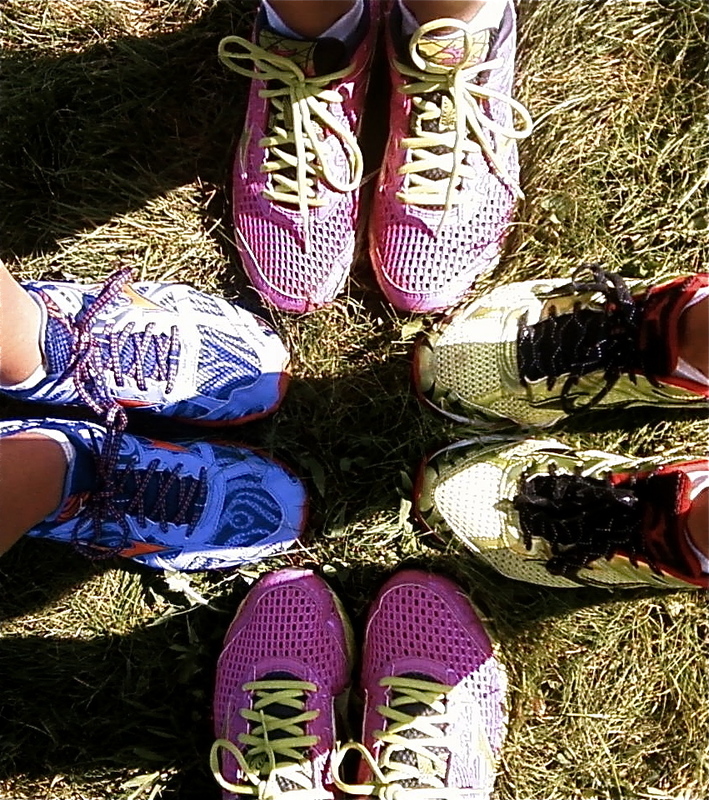 Mizuno has a great selection of fun colors. I am very happy I found the right shoe too!!! My husband can run in just about anything and I'm so jealous of him sometimes. Glad you found the perfect shoe! I can run in most anything, but I am still waiting on PERFECTION. Maybe I'll find it someday, maybe in some Mizunos. If they feel and perform as well as they look, I'm sold! Finding the right shoe is so wonderful!! :) Yay happy feet! i just bought some bright shoes today! they were asics though! love them! Good Choice Jen! I love mine too! I have the wave universe 4 and they are so light... great shoes! I'm thinking about trying some ligher shoes as well. These great colors and comments make me feel like a field trip to my running shoe store! 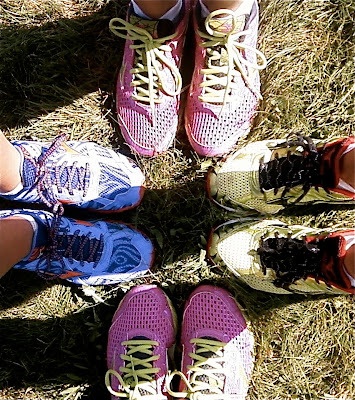 Hurray for a good fit and happy feet! I hope you have lots of brilliant runs in your new shoes. Another Mizuno fan! I need to try these out. Thanks for the info. Glad you found a pair you like! I had previously tried the Inspires and did not like them but I am in love with the Precisions I got through the Mezamashii project. Glad you found the perfect pair! I love both pair of my Wave Rider 14's and I got the Enigmas through the Mezamashii Project but I think they run smaller than the Wave Riders because the 8.5 is just too short for me. I guess I need to break down and call!